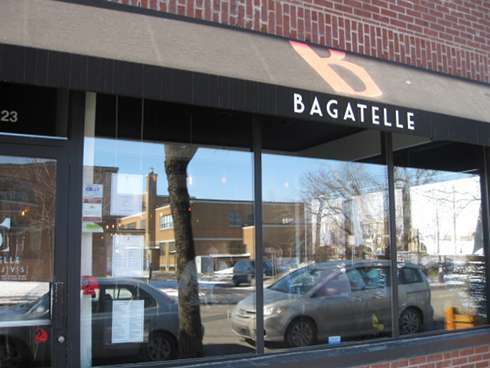 Bagatelle is a tiny little spot. When you walk in, you think it’s larger than its 50-person capacity but then you realize there is a mirror on the right hand side making the room look larger. To be honest, that mirror adds some depth and size to the place and looks good. Normally, I find mirrors tacky but it works here. There is a larger well-lit area up front whereas the rest of the restaurant is not as well lit. The décor is not incredible but the food makes up for it. The place is wheelchair accessible as is the washroom; although, it is a tight fit since the place itself is small. To start, we had a small smoothie ($2.50). Initially, I was shocked by how small it was – even, my coffee cup was larger than this smoothie, and as soon I had a sip, I wished I had a larger glass. The taste is in no way shape or form, small. This smoothie was thick and had a fruity flavour. Every sip of this smoothie made my taste buds blissfully happy. 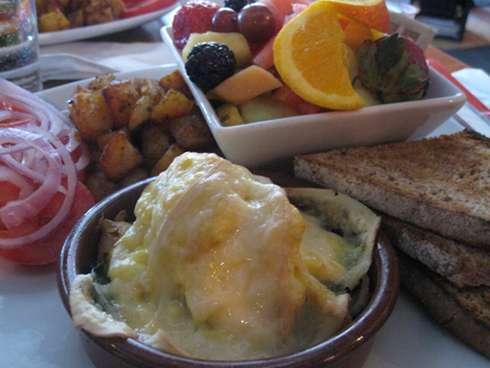 The raclette ($12.95) came with a spinach and eggs dish loaded with cheesy goodness, a side of potatoes, tomatoes and onions along with a choice of bread and fruit. The fruit was quite varied with many different types which is always nice to see on a plate as opposed to the same boring ones that places use. The eggs and spinach was tasty and the spinach worked very well with the eggs and cheese. 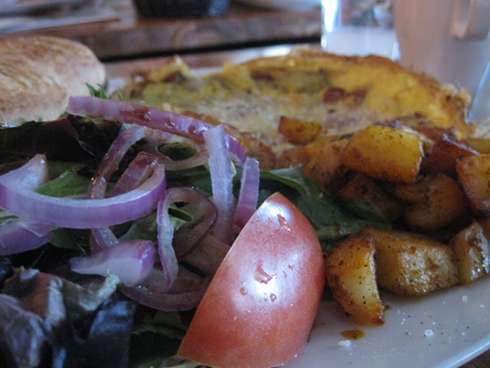 The frittata ($12.50) came with a choice of bread, salad and potatoes. The plate was quite full, the frittata was filling and the salad had a nice simple dressing as well. Even though, I am not always a fan of salads on a plate, it worked well with the dish. 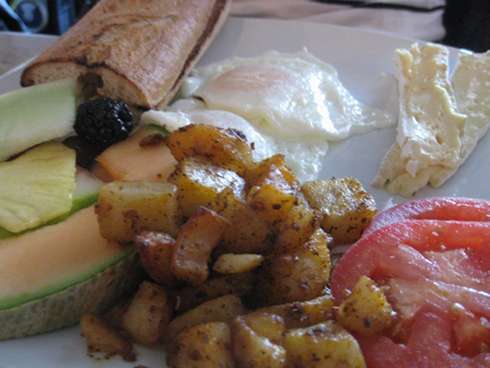 The Brie dish ($8.75) may seem simple with an egg, fruit, choice of bread and potatoes but the fact that it comes with brie cheese adds a little sophistication to this simple dish and with a pretty good price point (remember coffee is included as well). You get an amazing value dish and a little bit of fancy that other places would have charged more for. Service The staff here is quite personable. They were helpful with suggestions and didn’t rush us out the door even when we were chilling after out meal. Vegetarian With a menu this long you can be rest assured that you will have loads of brunch options that are vegetarian friendly so you should not be worried because the choice is plentiful. Wrap up Overall, this is a great bang for your buck spot. 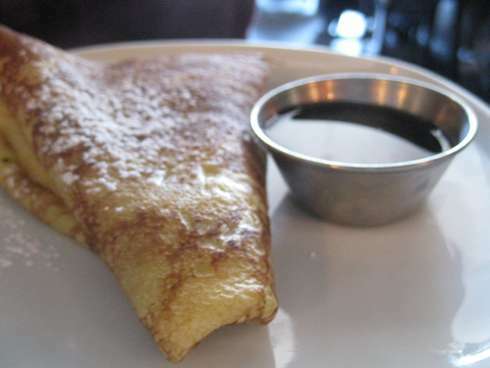 The dishes are tasty and filling and you can have a wonderful meal and not feel like you paid too much. Your plate will always be full as will your stomach. On the negative side, the menu lacks eggs Benedicts and waffles which would be nice to see and considering how large the menu is it wouldn’t be that hard to add a few of these options.